Heat output (W) Flat front: 59W or 90W; Open top: 56W or 67W. Faral Low Sill extruded aluminium radiators are available in two styles and four low radiator heights (from 242mm) to provide an attractive solution to very low sill heights. Faral Low Sill radiators are available in two styles, the Flat Front (FF) and the Open Top (OT), and are available in heights of 242mm, 245mm, 392mm and 395mm. 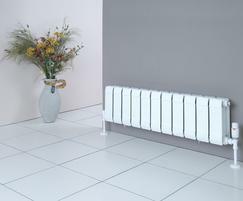 All radiators have a depth of 100mm. Faral Low Sill aluminium radiators are high output and high-efficiency radiators that can utilise an otherwise unused wall space. They are strong and also lightweight, to ensure ease of installation. The Faral Low Sill is manufactured using a unique epoxy polyester paint process that provides a strong impact resistant finish. All materials are completely recyclable and not harmful to health or the environment. The Low Sill Line aluminium sectional radiator is supplied in pre-assembled lengths of between 2 and 15 sections for transport purposes but can be extended on site. 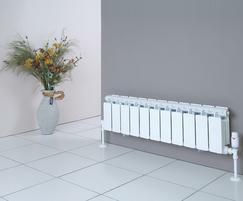 Radiators are supplied with one air vent, one blank and two bushes to receive the valve set and wall brackets. A full set of CAD files are available at the AEL Heating Solutions website. The Low Sill Line radiator is available in four models. Heat output verified to EN442, dt=50°C. 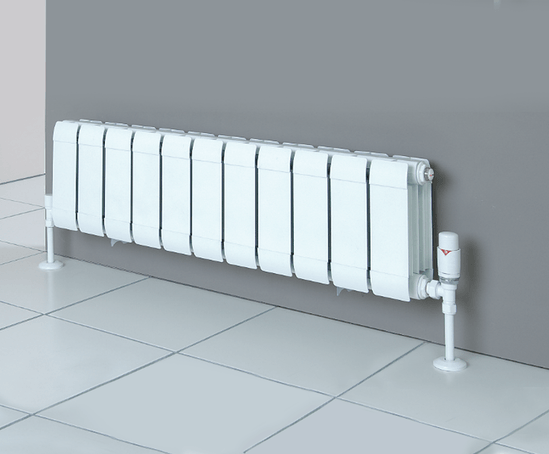 The radiators are tested and approved to European Standard EN442. This directive was brought into force to define “heat measurement sampling” for hot water radiators in all European countries, a positive step forward to ensuring radiators tested and approved will provide the stated heat output required and also give a guarantee that the product will be fit for purpose. EN442 provides a guarantee that the stated output of radiators from reputable manufacturers is correct and highlights and deters the use of poor quality untested radiators in European installations.